He strongly believes that sport is one of the most powerful mediums there are to guide young lives in the right direction, and away from the negative temptations of anti-social behaviour, crime and extremism. "During our ten-year history, we have proved with Met-Track that we can divert young people away from the anti-social behaviour and offending radar. We are a formula that works, and with all the debate around young people being radicalised of late, it's a crime that we could fold next year due to lack of funding." John recently wrote to the Prime Minister appealing for hep to keep his scheme going - the Cabinet Office recently declined an application by the project for support from their youth fund. "I had a polite reply from Downing Street," said John, "and not surprisingly my letter has been passed to the Home Office for a fuller response. The National Lottery have done a brilliant job in keeping us running this past 2 years - and we have developed and improved during that time. "There are no two ways about it - young people crave excitement, motivation, and inspiration in their lives, and there are many who will go to virtually any lengths in pursuit of it. If we can provide that stage on which they can develop improved self-esteem and confidence, for them to have fun as well as develop a sense of achievement, then maybe - just maybe - we can make some positive inroads into the radicalisation process that is currently ruining young lives and exterminating others." Met-Track has the support of the BIG Lottery Fund until the end of August 2016, but have no guarantee of support beyond that. An application for further support will be made to the Lottery but, should they decline and no other investor step in, John Powell has made it clear that he would be forced to close 80% of the scheme around London. Ironically, his work in founding and developing the project was part of the citation that earned him an MBE in 2013! 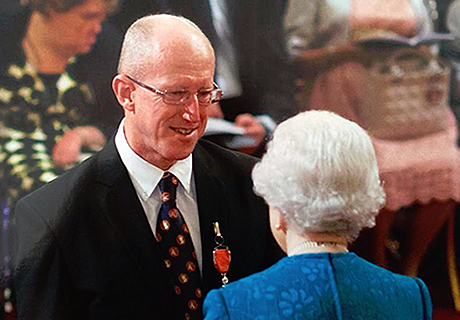 John pictured above receiving his MBE in 2013. His work founding and establishing Met-Track was part of the citation that earned him an MBE. 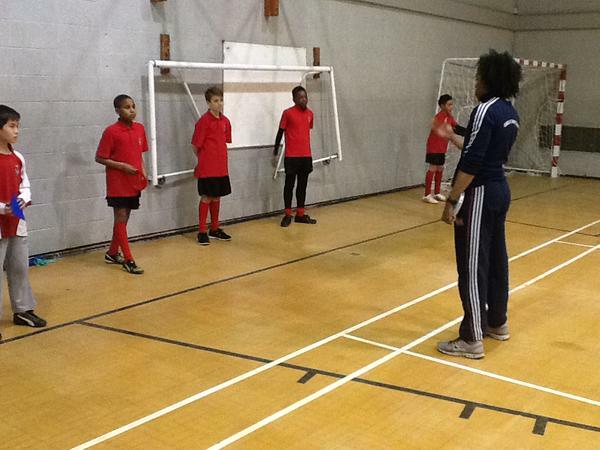 Met-Track coach Montell Douglas leading a session at Woolwich Polytechnic, Greenwich.